Feminine style and color, premium leather, flexible, lightweight, durable, and shockabsorbing support. Comfortable, supportive, fit well and look great on the feet. The suede lined, contoured footbed molds to the shape of the foot. Raised toebar encourages the natural gripping motion of the feet and aid circulation. Adjustable buckle closures to ensure easy on-and-off wear and a secure fit. The straps have a sharp edge and may create a sore. The toe strap may be not that durable. 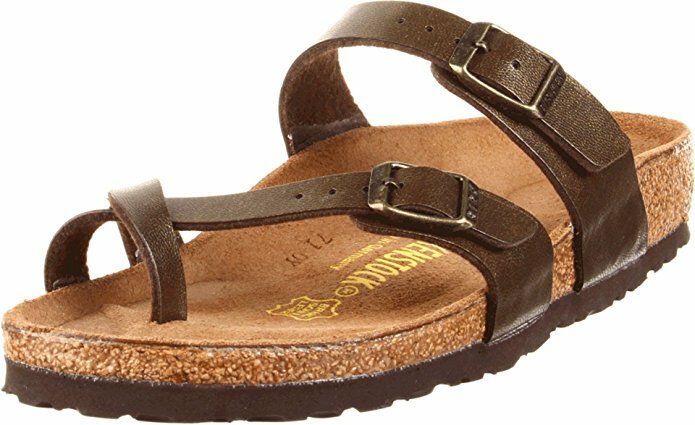 This is the summary of consumer reviews for Birkenstock Women's Mayari Birko-Flor Sandal. The BoolPool rating for this product is Excellent, with 4.50 stars, and the price range is $79.99-$99.99. 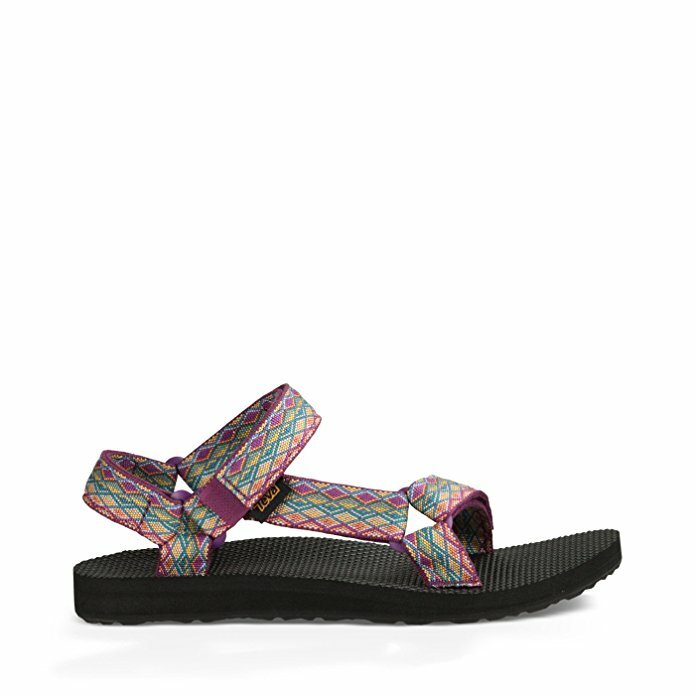 Birkenstock Women's Mayari Birko-Flor Sandal made in Germany with acrylic and polyamide felt fibers. Features include a premium leather upper with adjustable buckle closures to ensure easy on-and-off wear and a secure fit. Anatomically correct cork footbed encourages foot health. The suede lined, contoured footbed molds to the shape of the foot. Raised toe bar to encourage the natural gripping motion of the feet, exercising the legs, and aiding circulation. Flexible EVA outsole provides lightweight, shock absorbing support with lasting durability. 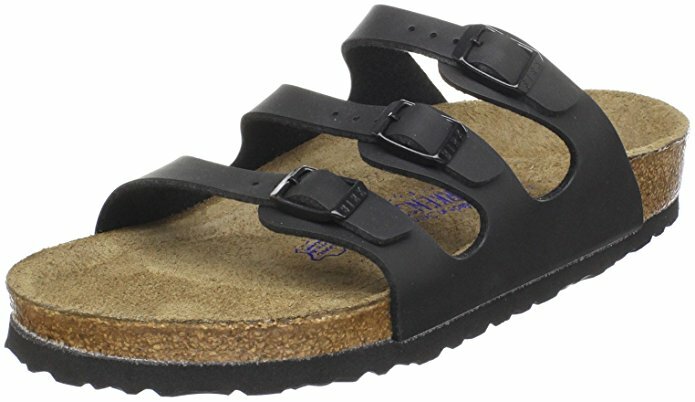 Users love the feminine style of Birkenstock Women's Mayari Birko-Flor Sandal. They are adorable, comfortable, and fit well. They look great on the feet. The sandal cradle the feet, provide excellent arch support, and completely molds to the feet after heavy wear. 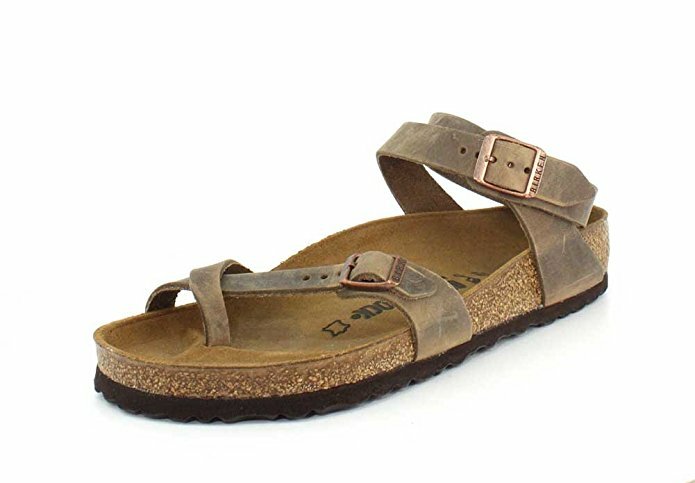 However, a few feel that Birkenstock Women's Mayari Birko-Flor Sandal is expensive, the straps have a sharp edge and create a sore, the toe strap of the sandal lasts for few months. 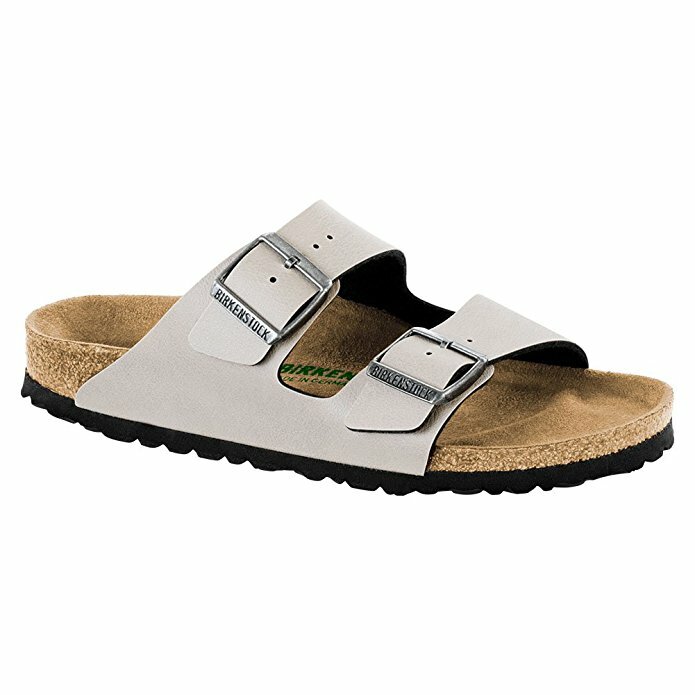 Overall, Birkenstock Women's Mayari Birko-Flor Sandal is comfortable footwear for everyday wear during spring and summer. Love the style. These sandals are adorable. Best to give as a gift. Wear them every day. these shoes are so adorable, i love them! I really wanted to love these sandals, but the stone color was a bit too olive green for my taste. They were perfect and I love them!!. I wear a size 8 US. I love these because I don't have the agony of plantar fasciitis anymore. Bought these as a gift for my mother in law and she loved them! I love the sandals I got and have worn them pretty much every day! I ordered these before reading the reviews. These sandals are comfortable and fit well. The straps have a sharp edge and create a sore. Birkenstock do fit a little different than other shoes. :( The leather strap that goes in between the big toe has broken and come off! I compared them to a pair of Birkenstocks I bought from a shoe store and everything looks legit. This's the first time I bought Birkenstocks from somewhere other than a shoe store and I won't make that mistake again. They fit well and were comfortable but Ive only had them for 4 months and they e broken. Loooove these sandals, fit perfectly, so comfortable. The straps have a sharp, hard edge and the one around the big toe rubs my second toe and created a sore as you can see in the photo. This's the first pair of Birkenstock' s I've bought in years and I'm very happy I did! I was happy with these Birkenstocks until a week ago. Leather will soften over time. The toe strap of the sandal lasts for few months. They fit well and looks great. After reading some reviews claiming they received fakes, I ordered a pair off amazon and the same identical pair from well known sporting goods store. ***UPDATE*** Only 2 months of wear later and already this pair is cracking where the toes and foot flex on both shoes. This pair lasted less than 4 months and the toe strap broke. I've a pair for the yard, a pair for the barn, and buy a new pair EVERY year and rotate another pair down the line. They fit perfectly and simply the best pair of shoes I've ever owned. The pair I received were authentic and fit great. They fit well and looked great, but after two weeks (about 7 or 8 wears), the front toe strap pulled out of the footbed. I wear out a pair in a year or so, and then order another. I've had others purchased from local retailers and they last for years, the two pairs I bought through Amazon both cracked within weeks of wearing. The antique lace color is nice. The style is feminine. The sandal completely molds to the foot and gives no blisters. The fact that these shoes come in a narrow size is especially a bonus for me. It's so nice to wear shoes that actually fit. ***i ordered another pair, still love the shoes. I'd previously bought this shoe on another discount shoe website. I've tried on other people's (who were my shoe size) but since they mold to your foot, there's nothing like having your own pair to wear in. I loved the mayari style so I was really happy to find them for such a great price, and in the color I wanted! Would recommend this product Birkenstock Womens Shoes Deluxe Shoe Care Kit, White, 53 EU/One Size M US to help keep them clean and smelling nice though. I fit an American ladies size 7.5 and go for shoes with a wide toe box, and am very pleased with how well the 37M fit. The antique lace color is really nice (it's kind of like a slightly shimmery off-white color) and the style is more feminine than I thought which is a plus, and after the break in period when the shoe has completely molded to your foot (which for me was only a couple days of wearing them a bit, and no blisters or anything like that), they've become one of the most comfortable pairs of shoes I've ever worn. These shoes are absolutely amazing, and I wear them almost everyday. They're the most comfortable pair of shoes I could ever buy. These are incredibly comfortable for all-day wear. Look, comfort, and real leather. The footbed is amazing and after about 3-4 weeks of moderate to heavy wear, the footbed mold to the feet as they are designed to do. These are incredibly comfortable for all day wear. Love these- look and comfort snd real leather. Size 42 fits perfectly with my heel seated comfortably in the heel cup and and big toe just short of the front lip. 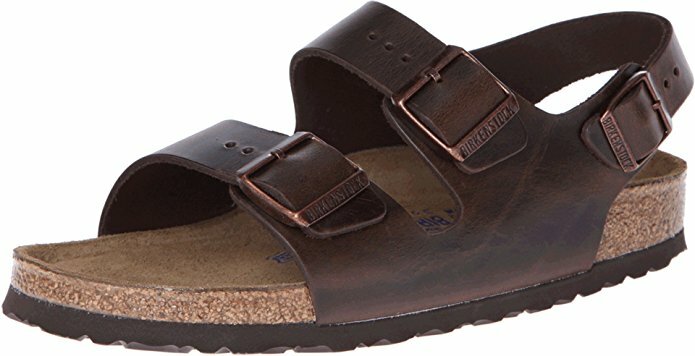 I wear women size 10 and always buy Birkenstocks in size 40 for a perfect not too big for. I typically wear a size 8 but have skinny thin feet so it's hard to find sandals that fit. My right foot seems totally comfortable, the left one has a little rubbing....but I think it'll be ok in time. The style is very nice - comfortable enough for weekends, but nice enough to wear in my casual office - and I'm sure I'll get years of use out of them. Surprisingly comfortable right out of the box! The foot bed is amazing and after about 3-4 weeks of moderate to heavy wear, the foot bed molded to MY foot (as they're designed to do). 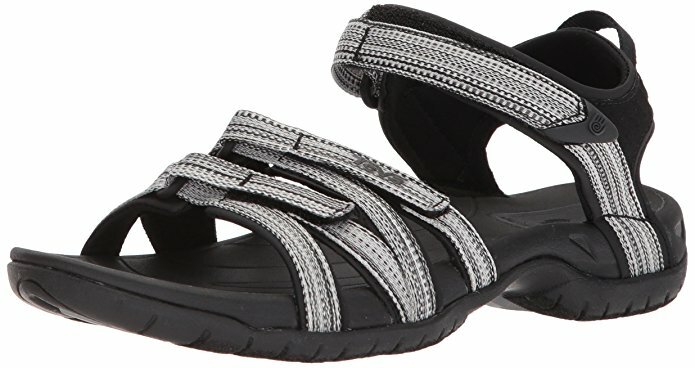 These sandals cradle the feet and provide excellent arch support. This shoe cradles your feet and provides excellent arch support. I've flexible flat feet and ordered these for arch support in the summer. True arch support and a nice looking summer sandal. The arch is impeccable and truly serves as great arch support for my feet. These have AMAZING arch support. Very comfortable for her to wear and helps a little in supporting her "arches" without making it look like she's going to break her ankles when she walks. I've gone without arch support for so long it hurt at first but in a good way but after a day my feet are already used the to having the support again. I wear 6.5 in most shoes and the 37 fit well. They're definitely a granola look but stylish enough to wear with most sundresses, shorts, leggings, etc. The straps modernize the look, too. These shoes aren't comfortable at first.